With only about a month before it’s time to hit the water again, I decided to dedicate this post to snow kiteboarding. The beauty of snow kiting is that it can happen almost anywhere there is snow instead of water! 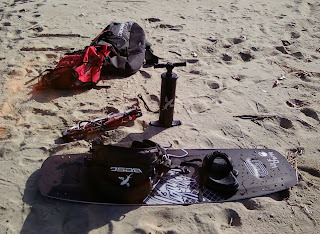 All the gear is the same as when kiteboarding on the water the only thing that changes is the board. Instead of using a kiteboard a snowboard is used. The need for a chairlift to get back up the mountain is eliminated with the use of a kite. Something I didn’t talk about in my kiteboarding basics post is the way kiteboarders travel, which is very important. When it comes to traveling with any type of kiteboarding whether on land or water it is similar to tacting back and forth like a sail boat. Below is a short video that better describes how kiteboarders can get back to the spot they started in (going upwind). Unfortunately, I have never went snow kiting but with all the snow we received in New Jersey this year it inspired me to start looking for a snowboard. And maybe by the next time I post I would have the pleasure of trying some snow kiting. Until then, below is a short video clip of some really cool snow kiting enjoy. This week’s blog post will teach the basics of kiteboarding. First off lets talk about the gear. An average kiteboarding setup will cost in between $1,000 – $2,000. A small price to pay considering the gear will last with several years of use and no expensive fuel is needed. Below is a list of the gear needed to get started. To the right above is a picture of all the gear. (Resting on the board is the harness) Once you have all the gear or even before, it is essential to take lessons which on average run about $80 an hour. 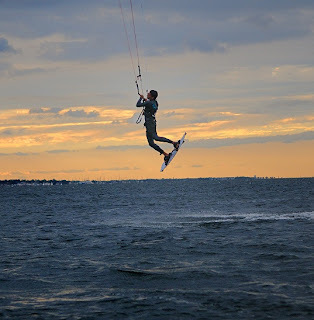 The only places in New Jersey to take lessons are greenhatkiteboarding and islandsurf-sail both located by the Barnegat Bay. The boards and kites needed for kiteboarding come in all different sizes to accommodate for riders of different weights and different wind conditions. Riders will often have a quiver of kites and boards to ride in any condition. The best condition or ideal winds to ride in are steady 18-20 mph winds. I have kiteboarded in winds from 6 – 12 mph to winds 35 mph gusting to 45 mph! The kite pictured on the left is perhaps the most important piece of equipment needed and I recommend to always buy new or at least within a year or two old. The technology of the kites and control systems have evolved so much that any kite three or more years old is very dangerous for beginners. A brief description of the way the kite functions follows. A rider takes out the kite of a bag and pumps air into it with a foot pump. The air fills usually one large bladder and four to five other bladders, which give the kite its shape and makes it possible to relaunch the kite when it lands or crashes on the water. The kite is attached by four to five flying lines that lead down to a control bar. When the control bar is pushed away from the rider, the two back lines are given slack and the power of the kite is null (de-powered). When the control bar is pulled in toward the rider, the back lines become tight and the kite gains power. Below is a video of me a couple years ago just cruising in the Sandy Hook Bay. This video I hope will give you a sense of how riding and just cruising takes place. Until next post, watch Catchin’ Air before the Super Bowl at noon on HD Theater! Welcome To JRH KITEBOARDING Blog! Welcome to my blog! 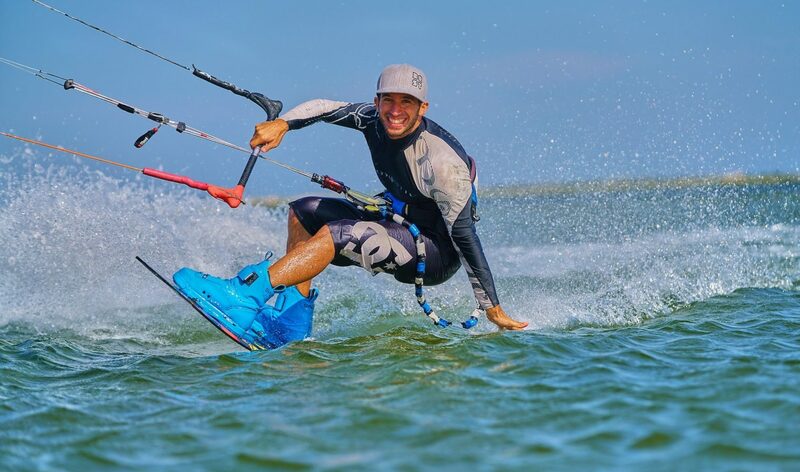 This blog will cover the extreme sport of kiteboarding! My name is John and I will kiteboard anywhere there is wind. I live in New Jersey so most of my riding takes place in NJ obviously, although specifically in the Sandy Hook Bay and along the Jersey Shore through ten of the twelve months of the year. The sport of kiteboarding has evolved so much since I got into the sport about six years ago. Even though the sport has been around for more than a decade people still question it when I tell them I kiteboard. So with this blog I would like to help increase the awareness for the sport. Recently on Discovery HD Theater the first show ever dedicated to kiteboarding has aired. The show is called “Catchin’ Air” and follows two professional Kiteboarders Andy Hurdman and Sean Reyngoudt around the world as they attempt to kiteboard not only popular kiteboarding destinations, but remote locations such as Alaska. Click here to view when the next episode airs on tv. Below is a trailer for the show. Until my next post enjoy and get ready for more kiteboarding!